1. I was the wedding facilitator for my very first ever wedding in the extraordinary form. I spent a good part of last week watching Youtube videos of weddings in the extraordinary form, and writing and re-reading the notes I got from Father P! But to tell you the truth, when you get right down to it - weddings in the extraordinary form are EASIER for the wedding facilitator than weddings in the Novus Ordo form. Once I got the wedding procession under way and got them to the first place where they sit down, the rest of it was a piece of cake! The couple does a tremendous amount of kneeling, there are no readers, no one does the prayers of the faithful (not even sure if there were any) and the couple visited the Marian altar AFTER Father processed out. And then they processed out. It was easy! 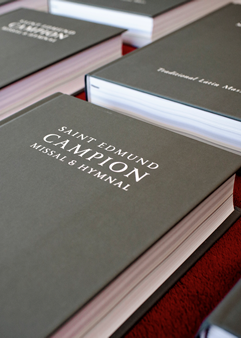 The hardest part for me, was getting those kneelers moved into place for the rehearsal (I had lots of help on the wedding day) and getting rid of 200 Gather books to replace them with the Saint Edmund Campion Missals, and then of course changing them all back after the wedding. 2. Yesterday was also the 56th anniversary of my parents wedding. I sort of liked that I was in attendance at a wedding that was probably very much like their wedding mass all those years ago. What I know of my mom's wedding is that they did get married in the morning, and afterwards their reception was in the hall and everyone got a "boxed" luncheon - as in the guests went through ad picked up a pretty white box that had all of their food in it, courtesy of Whitey's Restaurant - which is still in business! 3. Can we talk wedding etiquette? Yesterday's couple was so reverent and thorough in their preparations. For their payment envelopes they had written everyone's name on individual envelopes and included a thank you note along with cash! I especially appreciated this. It wasn't all that long ago that I had to remind the couple that they needed to pay the church and their helpers and the groom asked me how much for everything and then handed me, (I'm not exaggerating) a wad of cash and told me to take care of it! So I had to go to the bank the next day and get smaller bills to pay the altar servers and the sacristan etc. 4. Unfortunately, the ghost of past Facebook exchanges were present at yesterday's function. one of my young Facebook friends started arguing against church doctrines and sided for this new wave of public opinion. Going under the doctrine of, if you post something controversial, you should expect controversy, I protested. My posts were removed and I was then unfriended. This was a person I had literally watched grow up. A child who had dined in my home, played with my kids, held my hand once during a field trip and whom I once helped after an embarrassing missed trip to the bathroom. This person was homeschooled and part of our support group up until the eight grade and then attended one of our local Catholic high schools. So how do you react when you come face to face for the first time since then? after all of that history? "Well hello former Facebook friend. Are you still a heretic?" Somehow that didn't seem appropriate or necessary. As I was the wedding facilitator at my parish church yesterday, I just kept that hat on. I tried to be friendly and helpful to all and I assisted everyone that needed assistance. But when we first saw each other - for an instant - it was there. We both knew. Kind of sad. And to think we wouldn't even know each other's views if there was no Facebook in the first place. That's something to ponder as well. You are our friends and we value our friendship, and we'd love for you to come to our children's wedding, but we can't afford to have you come to the reception. It's a "You didn't make the cut" kind of letter. I'm not sure how I feel about it yet. I like the idea that at least I know where I stand and I don't have to keep watching for an invitation or wonder if one got lost. Mr. Pete is quick to point out that at least I don't have to get a wedding gift (although I did send a little something to one bride a few years ago because I wanted to and she was registered for it). So I guess there's that. But on the other hand, I can't help but wonder who did get invitations? and for that reason I don't go to these weddings. I think it would be awkward. I wish them all the best though. 5. I've been dealing very successfully with my ulcerative colitis for over 10 months now. I have almost no symptoms and I would say my days are from 98 to 100% normal. I don't eat anything with gluten in it and in fact don't eat any grains at all except for corn sometimes and I do eat potatoes. Along with really curing my symptoms, I also lost 30 pounds and cleared up my eczema. I've been very pleased with it and now that I've been doing it a while, it's easier and easier to prepare food for this lifestyle. Mr. Pete has been so impressed with this that he shared this with one of his acquaintances who was also suffering with ulcerative colitis. This person's symptoms were so bad that they were hospitalized twice and had to have blood transfusions. Interestingly though, at least to me, they rebuffed Mr. Pete for even bringing it up! Because they were Italian - and Italian people eat pasta. And even though someday, probably sooner than later, there was a colostomy in the future, this person was going to eat pasta and take expensive medications to try to control this as long as possible. It's so frustrating to have such good results with a relatively easy solution and not be able to convince others to give it a try. 6. Started my college "success" course that they require before you can be an online student - and I hate it. Busy. work. I dislike participating on a discussion board about silly topics. And I really dislike having to do all of it to achieve "points" of which I need 400 to put this all behind me. 7. A friend reminded me that 44 years ago this week, The Carpenters hit #1 with the hit Close to You! I am a big Carpenter's fan and have most of their albums, but Close to You, Rainy Days and Mondays and We've only Just Begun are my favorites! I find that weddings are always complicated for any attendee who isn't totally in sync with the couple's style: for Catholic weddings as well as secular ones. I think the general atmosphere is, "I don't quite know what's going to happen, but I'll do my best and maybe ask questions later." Did you have any particular tips for guests who were not familiar with the Extraordinary Form? Actually, Father P did an excellent job of introducing the rite to the congregation before he went into the main part of the ceremony. I think he put a lot of people at ease. 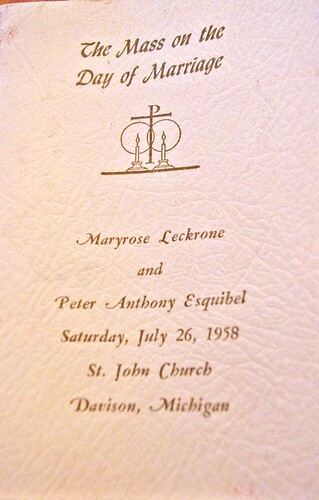 The bride and groom also went to a lot of trouble to put notes in the program and page numbers to go with the missals. I don't think anyone felt uncomfortable. Several people spoke about how glad they are that we have the Novus Ordo mass, but many also commented on the reverence and beauty of this wedding as well. That sounds awesome! The couple got the Mass they preferred, the priest got to teach, and the people could follow along. Win-win-win.